In particular, we are in New Orleans and have come down here to check out this custom made propane smoker built by Trevor over the past year. Trevor is part of a local bicycle festival and wanted to add an edge of barbecuing to it too. 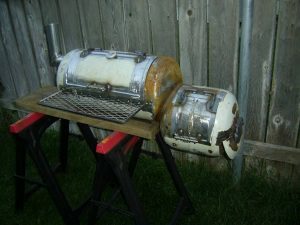 He built the bike first and then thought he should combine his two favorite things together, so he went ahead and constructed a smoker which is build from old propane tanks. Trevor tells us the bike rides really well, he even threw in some extra gears for the hills so that he doesn’t fall behind the group. In terms of the smoker, he is using a standard gas grill tank which is around 40-50 inches in cubic space. He found the old tanks at a local propane dealership that were broken and bought them cheaply, but reckons with a little chit chat you could score them for free too. For the firebox air vent, Trevor choose a different path and created a custom vent with an old Hurst shift handle. From that he was then able to bolt on linakages in order to open and shut the firebox door. Trevor is in the process now of braking it in, when we arrived he had already prepared his first brisket for the smoker and I tell you what, it was spot on, delicious! He will brake it out more over the summer when the bicycle festival starts going again. Have you built your own custom smoker? If so, let us know and what kind of boutique changes did you make to it that you will not see anywhere else? Trevor is selling these privately and is happy to custom make them for new customers, shoot us an email and we will pass it onto him to get the ball rolling.